My Grade 4 is onto a food lesson practicing the phrases "I want _____ and _______." 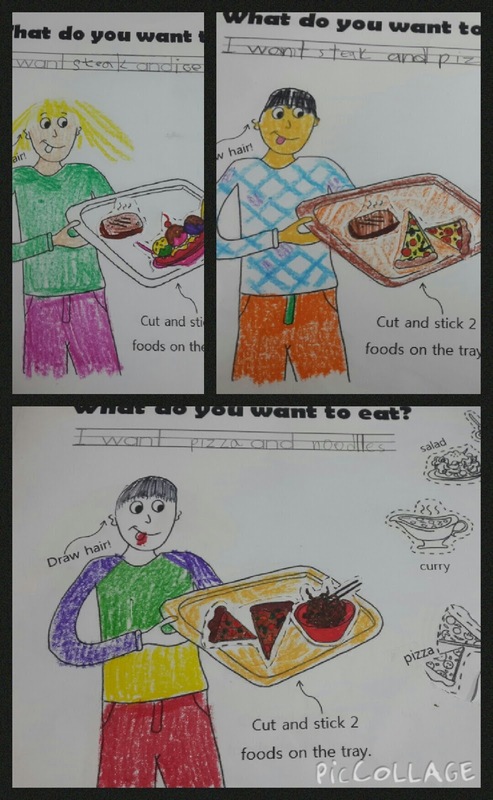 Vocab includes: curry, steak and salad, sandwich, pizza, soup and rice and spaghetti. It's a fun lesson about food and I wanted to do a fun project to match. We will be doing this next week, but for now, here's the worksheet if you're on to this sooner! To download this worksheet click here. I thought and sketched this up yesterday. All they have to do is choose two foods on the right and cut and stick them on the lunch tray. They can draw hair for the student holding the tray to make it a girl or boy. Then in the handwriting space provided they can write the two foods, finishing the "I want" sentence and practice their handwriting in the grid. I kept to food that was in the textbook as well as some foods they know like ice-cream and fries. I put 'a sandwich' to avoid them making sentence structure mistakes - as that could be confusing. After cutting, sticking and pasting , then writing their sentence, they can colour and you can display it on your walls or stick it in their notebooks. Middle School Lesson ~ Fashion! Mr. Morton Past Tense Practice!